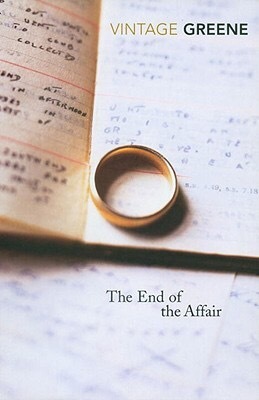 Review ~ The End of the Affair by Graham Greene. You know, there’s nothing like going back to an old favorite! Make your favourite drink, prepare some favorite snacks, change into your comfortable clothes and sit back and relax into blissful familiarity. I’ve read this book multiple times and I still think that this is possibly one of the most complex, and realistic, dissections of human emotion. Love, hate, confusion, lust and friendship, all play their parts. However, Greene does not do what most writers do and give each emotion it’s own familiar little compartment; love and hate often get mixed together, becoming one and the same, lust is often the focus, with confusion rearing its ugly head at the most inappropriate moments, and friendship arises, and ends, from the most obscure places. This is certainly not a plot driven novel. We know that the affair has ended before we even read the first page. We know another important fact as well, before we get even a quarter of the way through. This novel examines reactions, and the consequences of those reactions, whether it be physical or emotional. We read books to escape, I get that. But sometimes it’s nice to realise that those effed up emotions that you feel at the most inappropriate of times, are completely normal, and quite frankly, inevitable. Give this classic a go – it’s short, but packs a major punch.